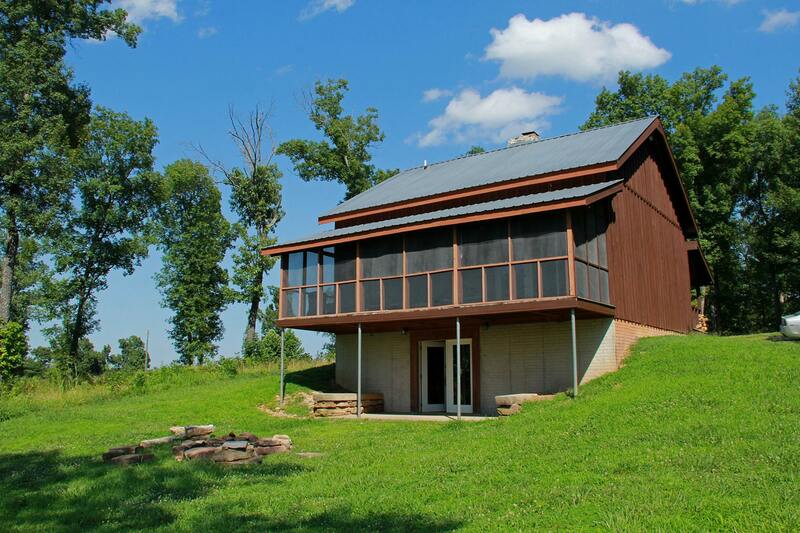 Buffalo River Arkansas Cabin Vacations Resort: ATV Four-Wheelers Welcome! Our Buffalo River Arkansas cabin vacations offer family-friendly outdoor fun. Come hike our mountains, swim or canoe our creek, fish, hunt, or go 4-wheeling. 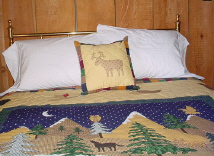 Outdoor recreation fans love our Conner Homestead vacation rental cabin. 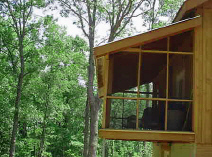 Nestled in green Ozark forest trees, it sleeps up to 12. 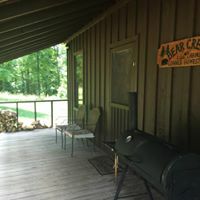 This roomy cabin is named for Pat's family who originally settled along the near-by White River, famous for canoeing and fishing adventures in NorthWest Arkansas. 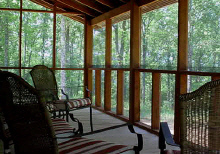 You'll feel like you're in a beautiful Tree House while you relax on our big screen porch and enjoy our green, restful views. I'm ready to plan a trip back maybe with friends to share this experience." You can cook outside on your own private charcoal grill or dine inside in the roomy dining area just off the fully-equipped kitchen. "The best! Loved the solitude and the beautiful cabin." Then prop up your feet and watch a movie or satelite TV. Listen to music or just daydream in front of the cozy stone fireplace. "What a delightful respite from Houston. . . Exactly what we were hoping for. . .
was very much appreciated and enjoyed..."
There's nothing quite so magical as gathering around a blazing campfire under the night sky, listening to night-time country sounds together. 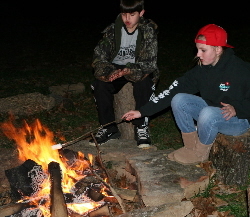 Children always love to roast marshmallows in the campfire ring just outside the cabin's walk-out basement. 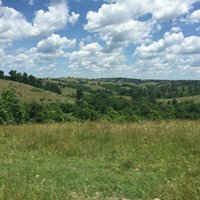 Next time you're planning a vacation in Arkansas or Missouri, stop by and visit with us. 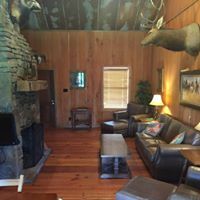 Once you experience our spectacular views, comfortable lodging, convenience to the Buffalo National River Park and all the best family day trips to Branson MO and Eureka Springs AR, you'll plan to make Bear Creek Log Cabins part of your family's vacation traditions.